Transform canned tuna into one delicious and healthy dinner! 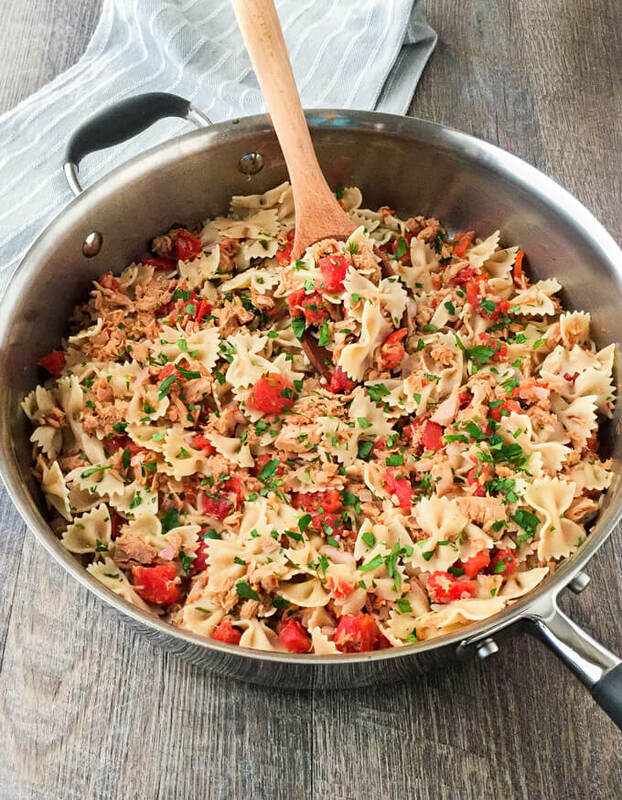 This Tuna Pasta is super quick to make, so it’s perfect for easy weeknight meals. Hey guys! Today, I wanted to share one of mine and my husband’s favorite canned tuna and pasta recipes. I’ve been making it for years, and we still enjoy eating it. It’s a recipe that I slightly adapted from a book called The Mediterranean Prescription. The book talks about the Mediterranean diet and health, but also includes several recipes. In fact, one of our other favorite recipes using canned tuna also came from this book! I have a few variations of it, but the original Tuna with Cannellini Beans recipe is the one I make most often. One of the best parts of this dish is that it can be made using pantry ingredients. I just about always have some cans of tuna, tomatoes and gluten-free pasta in my pantry. Which means I can have this whenever I get a craving or just don’t know what else to make! Another great thing about this Tuna Pasta recipe? It comes together really quickly, which makes it a great weeknight meal. Seriously, it doesn’t get a whole lot easier than this. I use tuna that is packed in olive oil. I’ve used tuna packed in water for this when I didn’t have the other on hand, but I think the olive oil packed kind is best in this recipe. As far as the white wine in this goes, I really don’t have an equally tasty substitute. I’ve tried chicken broth in place of it and it’s just nowhere near as good. And no, even a little bit of lemon juice doesn’t work either. Been there, tried that, too. If you don’t drink white wine, then you could just buy a small box of it. I recommend a Pinot Grigio for this recipe. The perfect amount of acidity it adds to this Tuna Pasta just makes the whole dish. I pretty much only use Jovial Foods brand of brown rice pasta for my recipes now. If you are looking for a really good gluten-free brand of pasta, this is one you need to try. The taste and texture are amazingly good. You can find it at Natural Grocers, Whole Foods and online. I think I’ve only seen the bowtie pasta kind at Whole Foods so far though. –> Just my honest opinion, not a sponsored endorsement. I like promoting brands and products that I love and use. 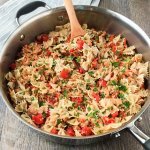 This Tuna Pasta recipe is quick to make and can be made with pantry ingredients that you might just have on hand right now! Drain oil from cans of tuna into a small bowl and set aside if using or discard. Place the tuna into a medium-sized bowl and flake with a fork. Bring 3 quarts of water to boil in a 4-quart pot. Add salt, then pasta and cook according to package directions until al dente. While the pasta cooks, heat 3 tbsp of olive oil in a large skillet over medium heat until shimmering. Add the onion and cook, stirring ocassionally until they have begun to soften, about 3 minutes. Add the tuna and cook for another 2 minutes. Stir in the garlic powder, Italian seasoning, crushed red pepper flakes and parsley. Add the wine, and cook, stirring gently for about 1 minute. Add the tomatoes and let cook for another 3 minutes. Drain the pasta well, then add it to the skillet and gently mix until well combined. Top with additional fresh parsley if desired. By Tempie at February 28, 2018 .